I'm not sure if you've heard about H2O Plus but I definitely knew about the brand a decade ago when I was working in China. I used to visit high-end department stores and stroll along their beauty section (imagine Rustans locally) and check out how women would spend hundreds and thousands of RMBs (Chinese Yuan) for skincare! 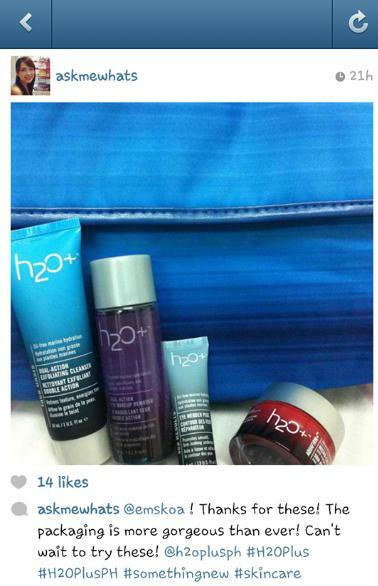 One of the many brands that caught my attention is the lovingly blue-packaged skincare brand called H20 Plus. Why? The fact that the products are marine-based and way back, I already have this habit of reading online reviews. According to users, H2O Plus products are lightweight and works for most skin types! Unfortunately, I didn't purchase any full sized H2O Plus products back then as I was busy trying out samples SAs gave me (It helps to be friendly you know!) :P The first and only H2O Plus skincare I've tried is the H2O Plus Face Oasis Hydrating Treatment and this product is indeed lightweight and very soothing to dry skin! The product reminded me so much of my favorite Clinique Moisture Surge Extended Skin Relief! Fast forward to today, my brother (in Shanghai) swore on their men's skincare line and I'm happy to share to him that the brand is finally HERE! And when I read about this wonderful news online and received a lovely H2O+ pack from our friends from Scent and Beaute Concepts Inc. (thanks Ems! ), I had to blink twice as the brand went through a lovely makeover! They are not the "plain Jane" marine blue colored packaging that I knew as the products are now housed in colorful, better looking packaging! And here's a lovely news that I want to share to readers who had to travel or ask their friends abroad to help purchase H2O + products. First, you don't need they are now available at SM Aura Premier Department Store. 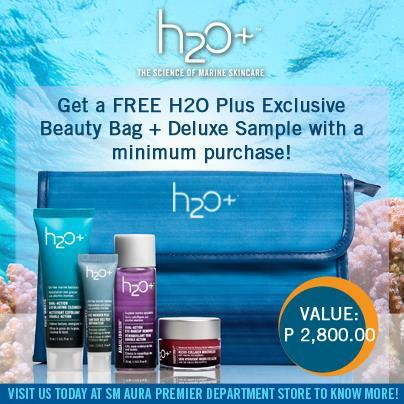 Second, you get to bring home the Exclusive H2O Plus Beauty Bag with Travel Deluxe Travel Sizes with a minimum H2O+ purchase of Php6,500.00. The pouch itself is so worth it as it works as my makeup bag for now! This gift values Php2,800.00 so if you plan to shop, shop well and bring this baby home!